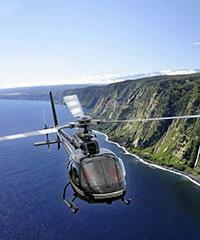 Big Island Helicopter Tours play a larger than life role for the Hawaii visitor. The Big Island, unique among all the other islands that make up the chain of islands of Hawaii, is the only one that is continuously visited by live volcanic activity. The volcano literally never stops pumping up lava from its origin in the depths below the Earth's surface. This volcanic activity, as you can imagine, is very dangerous and the general public is not allowed into the areas where the major lava flows occur. It is for this reason that the helicopter volcano tours play such an important role because it is only from the air that the major lava flows, lava channels, vents and general activity can be observed from the wide spectrum viewpoint. 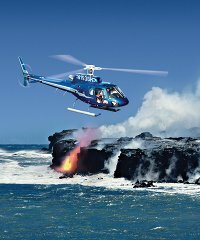 Yes, Big Island helicopter tours are a bit more expensive than the average tour but if you do have the means, one of these helicopter volcano tours should be high on your list of 'must see' activities. You will likely never be able to duplicate this experience again during your lifetime. 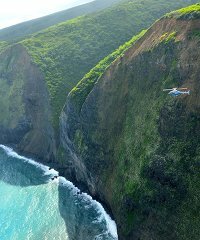 Luckily Tom Barefoot's Tours offers a large array of discounted Hawaii helicopter tours. Where should you depart from on one of the Helicopter Volcano Tours? The Big Island is the largest of the Hawaiian islands and as such, it is a long way between various locations. 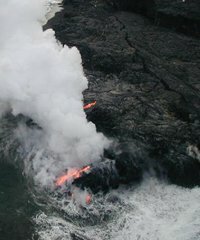 The majority of visitors to the island will find themselves on the Kona side of the island but the volcanic activity is found on the Hilo side of the island. There are advantages to take a helicopter from either side. If you are staying in Kona, your departure point will be close. The tour to the volcanoes will be longer however and is generally about 2 hours in length. You will see the volcanic activity but you will also be treated to the areas in between and most of these tours will also take you up north to the Kohala region and Hamakua with its beautiful shorelines as well as to an overview of the Waikoloa white sand beaches. If your intention is just to see the volcanic activity and to save some money as well, you would be well advised to drive your car from the Kona side to the Hilo side and take the helicopter tour directly from there. These tours will usually be about 50 minutes in length and will cost about one half of the Kona departure tours. You must of course be willing to make the 2 1/2 or 3 hour one-way drive over and back in order to arrive at the heliport. Your choice, both tours are well worth the price of admission. The A-Star is generally considered the "gold standard" for helicopter flights. No matter where you sit you'll have 180-degree visibility. The rotor shaft does not come between the front and back seats and there are no visual impediments interrupting your view forward. The back seat is raised to give a better view above the seats in front and there is an abundance of windows. The Eco-Star or Whisper-Star is actually the enhanced version of the A-Star and is generally considered the "Cadillac" of the touring helicopters. These helicopters are wider allowing for all bucket seats for more comfort. They have about 20% more viewing capacity through the larger windows and they produce less noise as heard from the outside. The Hughes 500 is small, fast and maneuverable. It seats only 4 passengers so each person is guaranteed a window seat. It is often also flown with "doors off" for spectacular photos. The Bell Jet 407 is often referred to as the limousine helicopter because of its unique seating arrangement. One client sits up front with the pilot, three clients sit in the rear facing forward and two passengers sit in the rear facing backwards. Big Island of Hawaii Helicopter Tours do not pick up at the Cruise Ship Dock. The majority of these helicopter flights however can be reached by a short taxi ride from the dock to the heliport or if you prefer Tom Barefoot's Tours can arrange a Rent-A-Car for you that will pick you up via shuttle at the dock. These flights will be available to you on Tuesday from the port of Hilo or Wednesday from the port of Kona. Do you still have questions about Helicopter Tours? 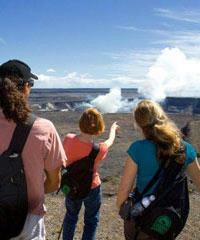 Are there certain regions of the Big Island where helicopter tours are less expensive? 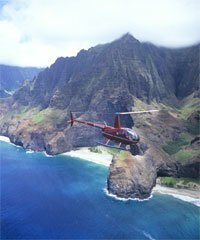 Can I request a particular seat on a Big Island helicopter tour? Helicopter and Motion Sickness on the Big Island? 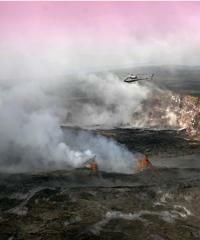 How high will the helicopter fly over the volcanic activity on the Big Island? 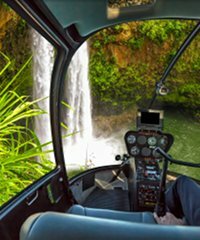 I know that individual body weights are a factor on helicopter flights, how will my weight affect my seating on one of the Big Island helicopter tours? Is it better to take one of the Big Island helicopter tours with doors off or doors on? So, this video segment is going to be about helicopters on the big island. Helicopters on the big island are among the most requested activities that we have in all of Hawaii. Certainly, with regards to helicopters in general, this is an island that many of the people prefer to do as adverse to going on one of the other islands. So, what is the reason for that? 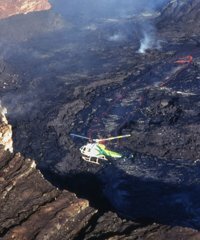 Why do people want to do the helicopter flights on the big island? Obviously, the answer quite simply is the volcanoes and the volcano area that we have on the big island. The volcanoes have been going off continuously to a lesser or greater extent since the early 80s. It is just a spectacular view that you are in all likelihood probably not going to be able to see again in your lifetime. But, yet this is available to us here in Hawaii on the big island almost every day. We're seeing lava that is just pumped out of the volcanoes flowing down to the ocean in lava streams. Oftentimes entering into the ocean ... giant plumes of gas and steam when it does enter into the ocean ... this changes from day to day, week to week, month to month ... The flows and how they work. Also, up at the Puu Oos or the vents, you're seeing activity where lava is coming out, going over the top, looking down into the vents. So, you have this incredibly, red hot, actually, orangy red lava that in contradistinction to all the brown lava or black lava surrounding it really is highlighted. Now, let me take you back to that map of the big island so you can get a sense of what is going on. So, here is the big island. The majority of people when they come visit they're going to be staying on Kona Coast, Waikoloa, or down in Kailua-Kona. Very few would be staying over in Hilo, but, some we do. But, yet, the volcanic activity you are going to be seeing is in this area. This is Kilauea. That's the volcano that is going off. It's located on the side of a giant ... of Mauna Loa. If these were in relief you would see there is a giant mountain here and another one here that are about 13,000 feet plus. But, yet, they are not going off currently, but, Kilauea is. If you are on this side there's a couple ways to do this to see the volcano. Certainly, the most convenient way for you to do this would be to just get into a helicopter in either Kona area or Waikoloa and then fly over. These are generally going to be longer flights. In fact they're probably going to include a full island flight. Maybe 2 hours or so in length. So you are going to be leaving from this coast line, going over what they call the "saddle" between these two volcanoes. Seeing lava flows that all throughout this area ... that 1800s, 1700s ... there are all different ones layered one on top of another. Then you will be cruising over to the volcanic area. Here you will be able to see Kilauea, Halemaumau, the various vents we have in this area and all the rift zones and lava streams that we have that are heading down to the ocean. This is the major area on the island and this is what you will be seeing. So, you see that until you got that completely saturated and you really have an understanding of it and can see it well. Then they're going to go back over to Hilo and then up the Hamakua coast ... which is a spectacular coast line ... up to Hawi, back around Waikoloa. If you are staying in Kona they are going to go down this coast line which you can see all the major hotels we have on the beaches, the beautiful beaches and bays that we have on that side. Then you're going to cruise back to Kona. So that is a way to do it. That is the most complete way to see the entire island, for sure. But, it is also the most expensive way, because you're in the air a couple hours. 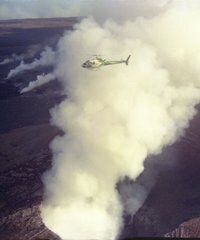 Since the primary thing that most people want to see on the big island regarding helicopter flights is Kilauea. You can make this less expensive for yourself by driving over to Hilo and leaving from Hilo in a helicopter and just heading up to the volcanic activity. This is going to be maybe a 45, maybe a 50 minute, maybe an hour flight. It may include a little of the coastline here that you can see as well. But, this would be the most affordable way to do it. Yes, you do have to make the drive. There is nothing wrong with that. It just takes a little while. It could take two-and-a-half or three hours to get over there, so you might want to consider organizing a tour helicopter flight that would leave perhaps mid morning or so. Because you have to drive that entire distance and you don't want to make it early, early those are great flights. If you don't mind getting up really early and taking your rental car across the island you can certainly do that. But, a more reasonable time for most people would be like 10 or 11:00 and kind of organize that. Which means that you need to organize those early, because those flights can disappear. It's not just something you can wake up on the day of, or the day before and go, "yeah let's do the 10:00 flight" and get over there. These are things that are best organized in advance. What that enables you to do is to leave right form Hilo. As soon as you get up in the air you're not even that long ... maybe 10 or less than 10 minutes ... and you're out over the area that you're wanting to be seeing. You're not going to see any of the rest of the island, but, then again you are not going to have the expense either. These are the basic helicopter tours that you're going to be wanting to book while you're on the island of Hawaii. There are a number of different aircraft we have that do this. One of the popular, most popular, I guess, would be the A-Star helicopters. These are aircraft that are designed specifically for the purpose of sightseeing. They've got beautiful view windows. They can carry 6 people. You've got 4 people on a bench seat in the back and 2 in the front, plus the pilot. You've got very, very good views. If you want to enhance your view on a similar aircraft you could also do, what we call the Whisper Star which is made by the same company. It's wider, it has bucket seats instead of the bench seats, a little bit more comfortable. There's more viewing window space so you're going to be able to see a little bit more. In both the AStar and the Whisper Star, they have taken the rotator shaft out of the fuselage area ... they've taken it out of the cabin ... they put it behind you. You don't have that in your way and also the back seats are higher than the front seats so you got a bit of the theater seating, where you've got good views in all the seats that you could be sitting in. There is also the ... they call them the Bell 407s, that we have there. There is the Bell Jet Rangers and there's the Bell 407. The Bell 407 is the one that is more primarily used on the big island. This is kind of ... it has executive seating. Actually, you sit in the front or you sit in kind of a cabin behind with seats facing each other. So, you're either looking forward or looking back. Just because of the nature of the flights, you've got beautiful views wherever you sit on these. So, that's the other type. Then for those of you that really want to be a bit more adventuresome ... and those of you that are photographers are really concerned about making sure that you get the best pictures ... the Hughes 500 can operate with doors off. This is bout as good as it gets because you have nothing between you and the volcanic activity down below. A little scary for some people. You're completely strapped in, but you've got nothing off to your side. You get a little bit cooler, because you've got the air rushing through. So, it's not a flight for everybody, but, for the people that really want that type of excitement and those good photographs, you really can't beat it. So, those are the types of helicopters that we have. Those are the main points I wanted to bring up about the helicopter flights on the big island. Definitely well worth it. You're not going to be seeing the volcanic activity on any of the other islands of Hawaii and probably hardly any other places in the world that you'll actually be able to take a regularly scheduled flight to go see that. If you have an interest, this is the place to do it. Helicopters on the big island. Hawaii helicopters provide perhaps the most magnificent way to see the islands. The fact that fully 75% of the islands of Hawaii can only be seen from the air makes helicopter tours of Hawaii that much more special. 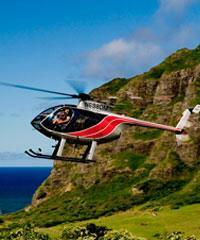 Kauai helicopter tours are arguably among the best helicopter rides of any in Hawaii. 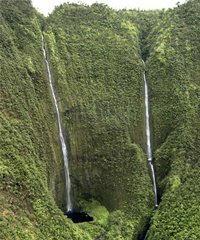 It was no accident that Kauai was the first island to be viewed by helicopter tours. Helicopter and air tours are undoubtedly the most spectacular way to see the island of Oahu. Most people think of Oahu as just Honolulu and Waikiki but its scenic North Shore and beautiful Koolau and Waianae mountain ranges are truly spectacular. View isolated valleys, hidden waterfalls, secluded ridges, triple-canopy rainforests, and mountain summits. Some areas are so dense and rugged they are impossible to traverse on foot.